Great investment opportunity in Bahria Town Phase 8 Rawalpindi. 5 Marla Plots starting from Rs. 18 Lakh. Bahria Town has come a long way since the launching of its first phase back in the late ’90s. Every new project was better than the previous one. After the first 6 phases, Bahria Town moved out of its premises to the other side of GT road with phases 7 & 8. Bahria Town had learned a lot from its previous phases and had a better and clearer vision with more resources while developing phase 8. It was better planned with more space at hand to develop an even better residential society, in times to come it would become one of the best-developed societies, if not the best one. Phase 8 was a phase which had everything in it from schools, colleges, universities to a cricket stadium. Bahria Town, like any other world-class organization, kept on evolving. Bahria town has brought almost all the famous brands to phase 8 to facilitate its residents including a world-class gold standard cinema (CineGold) and now they are constructing Pakistan’s first international standard theme park. It doesn’t end here. 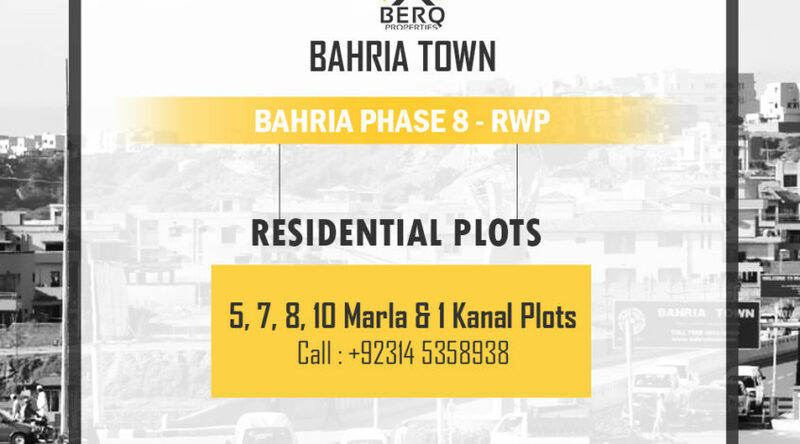 With the recent announcement of the construction of Rawalpindi Ring-Road just behind the BahriaTown phase 8, new prospects have arisen for phase 8 and it has again become the new favorite choice for investors and people who are looking to buy a home in the twin cities. 160 Main Boulevard designed on the pattern of Champs Elysees with high rise mixed use Commercial buildings. State of the art Urban, planning and Engineering design. Fully carpeted 160’, 120’, 80’, 60’ and 50’ wide road network. Footpath along all Main Boulevard and internal roads. International standard community facilities including primary, secondary Schools, colleges, university, library, sports complex, clubhouse, hospitals, and the Mini Golf Course. Extensive plantations and horticulture work in green belts and along roadsides.